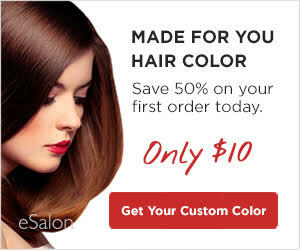 Want to try eSalon? Let me refer you and get $10 off your first order. Subscribe to their service and your first order is just $9.95 plus shipping! Disclosure: I switched the order of two eSalon posts because the old one keeps coming up in search results when I'd prefer my readers find the new post first. Since August 2013, my opinion of eSalon has drastically changed. I've had the pleasure of touring their facility and having a personal color consultation and application at their headquarters in Culver City, CA, and their team has gone above and beyond to help my parents and my sister each customize a color to try. While I'd prefer you read the newest post which features my trip and color experience, I will continue to host the old post below. After seeing ads online for a while, I decided to try eSalon. The appeal of customized color drew me in, and a deal to pay just the shipping charges convinced me to see how it works. eSalon begins by asking questions about hair length and texture, and coloring habits. I shared my natural color, my current color, and my desired color. Based on eSalon's images, I picked 5.1 Medium Ash Brown and included a note explaining that I want to counteract the brassy red tones in my hair and get a cooler color. I also shared my stylist's feedback on what level my hair color currently is. A short time later, I received my hair color kit, which included 6.0 Light Brown (note -> the eSalon coloring advisors must have changed it based on my photos). I had no problem with the switch to light, appreciating their help as choosing a color online is tricky. However, the switch from an ash tone to a neutral was unexpected. I decided that perhaps eSalon's ash tones are meant for graying hair and the neutral would be a better fit, and went forward with the coloring process. The eSalon kit feels overpackaged. It's attractive, yes. But it feels a bit wasteful. I'm not entirely sure how to improve this without risking product damage, but just simple changes like packaging the two sets of gloves together or omitting the extra box that holds the accessories might help. Unfortunately, all that packaging didn't stop the developer bottle from leaking during shipping. It wasn't too much of a leak but I took out all the pieces before I found the gloves and got some on my hands. It's hard to see, but the shiny area on the bottle below is leaked product. I brushed out and sectioned my hair, then applied the stain guard stuff to my hairline (it's basically Vaseline). Unfortunately, since I didn't think to read all the way to the end of the instructions first (my bad), I didn't realize I was sent a kit for root touch up. There was absolutely nothing in the instructions about coloring all my hair! This was a WTH moment. I was coloring my hair to tone down the brassy rust color and the instructions only have me coloring my neutral brown roots? I worried there wouldn't be enough product! I am grateful I was able to spread the color through all my hair, with just a bit left over for the final step - a color rinse. Thirty minutes later, while in the shower, I mixed a small amount of water with the remaining color and worked it through my hair for two minutes. I've never done this before, but eSalon's instructions suggest this step helps increase the shine. It's a little messy, but easy enough. It took using the provided color safe shampoo and conditioner to get my hair more normal feeling. My hair felt dried out so I used some leave-in conditioner and let it air dry. So, the color? It's fine. It's slightly darker than what it was before and still very red-brown (not what I wanted) but I believe the bottle gave me pretty much what the neutral light brown looked like on the eSalon website. It was my choice not to return the neutral or contact them when I got it, so I can't blame eSalon for the color on my head. I am annoyed I didn't get ash in the first place and that I was sent a touch-up kit and not a full head application (or the instructions were wrong?). eSalon should have contacted me when they changed my color. That would have given me the chance to understand why and ensure the change fits my color goal. I want to be very clear that the color came out totally even, which is pretty awesome since I had about an inch of root growth. For those who haven't used eSalon before, you'll be automatically enrolled in auto-shipping. As soon as your order goes out, you can log in to your account and turn that auto-shipping off. No tricks. That's what I did and all is well. If you forget, you could end up with an unexpected box of color and a credit card charge in 6-8 weeks, however. I would like to hear from others who have tried eSalon, or those who decide to try it out. Let me know if you get the right product, if their staff make changes to your order, and if they do make changes, do they let you know? Perhaps I should have done a better job Googling eSalon reviews. Myra, of Musings of a Housewife shows just how odd the communication and color result can be with her eSalon review. 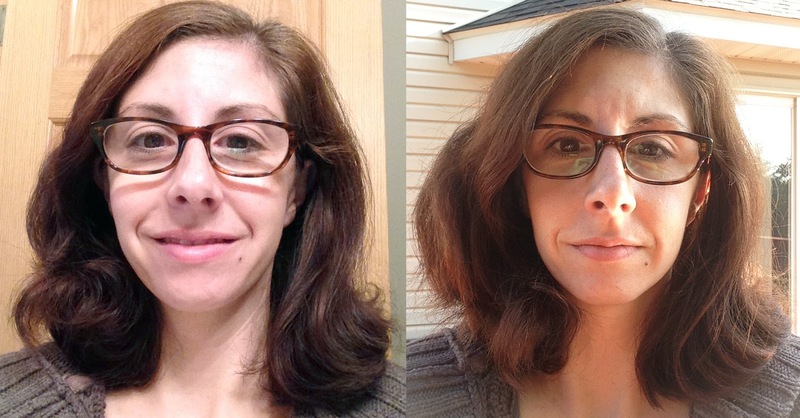 Jessica of InTruBeauty had a better experience with eSalon, as well as Kristey of The Zookeeper blog. I really wanted to find out why I received a non-ash color and a roots kit when I ordered for covering my reddish color with an ash brown, so I wrote to eSalon's customer service team. The response, which doesn't really address either question, is below. Thank you for filling out our Feedback Questionnaire! We apologize that your hair color turned out differently than you expected. Just like a salon, we can adjust your custom formulation based on your feedback. To help our colorists determine the best way to reformulate your order, please send us a current picture of your hair. By seeing your hair, we will be able to better evaluate and make recommendations for your hair color selection. A picture taken outdoors in natural daylight, or in a well-lit room, showing your hair, hairline, and face, would be best. You can send us the photo by attaching it to your reply email. We look forward to reviewing it and providing personalized recommendations. P.S. To better serve you, we've made it easy to find answers, quickly and efficiently through our website. If you have any questions please follow this link: https://www.esalon.com/support. Very soon after I emailed eSalon's customer service, I got a phone call. There's nothing I like more than a pleasant, helpful customer service rep calling to personally answer my questions. It's so much more sincere than email. I'm sure there are plenty of people who'd rather keep emailing back and forth, but not me. Anyhow, I have a very logical explanation for the color I received and the instructions, both of which have to do with my color. eSalon's hair color is highly pigmented, which means I could end up with a color I don't want if I go any darker. However, using a lighter color makes it more likely to have reddish tones. It's a catch-22. What's awesome is the compromise is something I'd not have thought of myself - they're sending me a shampoo that will help tone down the brassiness. I'm very appreciative! In full disclosure, the rep mentioned eSalon is looking at ways to package the two sets of gloves together as a way to be more kind to the environment. That's a sign of a company that cares about their brand and their customer. Please visit my May 2014 post about eSalon! It depicts my current feelings about the company and their product. The above, older, post is out of date and no longer reflects my opinion of eSalon. What about the glue feeling when rinsing? The most common reason for that feeling seems to be in those rinse steps. Start with a color rinse (mix the bottle remnants with water and run through hair while working it through really well with your fingers to loosen things up), then rinse in the shower and shampoo well, followed by conditioner. The color rinse and a good shampoo while rinsing out the color will help a lot. Another thing that could lead to that sticky feeling (which I do remember my first time) is using more product than is needed. eSalon's color has more pigment than traditional box color so if your hair isn't super thick or very long, you may not need the whole bottle to get good coverage. Have any of your family tryied eSalon? would like to know what the experice was for them. I signed up both my parents and my sister. So far, my dad just received his kit but with his complex very grey hair, eSalon experts are going to help explain the instructions so he gets the desired result. My mom has a lot of color options, so she hasn't yet decided what direction to take and my sister has really super long and thick hair with multiple shades from past permanent color and a lot of regrowth, so her eSalon plan isn't yet decided. I'm going to help her apply it once we figure all that out. I'll definitely post updates once everyone has had a chance to try eSalon! I've been using eSalon since Jan.2003 (free with $5 shipping got me!) and I love it. I have had a great experience with the color and the coloring process. It looks so much more natural than the store brands I was using. And the interactions with the customer service I've had--(changing the schedule, adding the shampoo-minor things) have been great. I've told them that they are one of the few customer service departments I actually like. My new hairdresser had never heard of eSalon and she was interested in a very suspicious way. She said she was going to research it online. Ha ha. Wonder what she will have to say at my next cut.